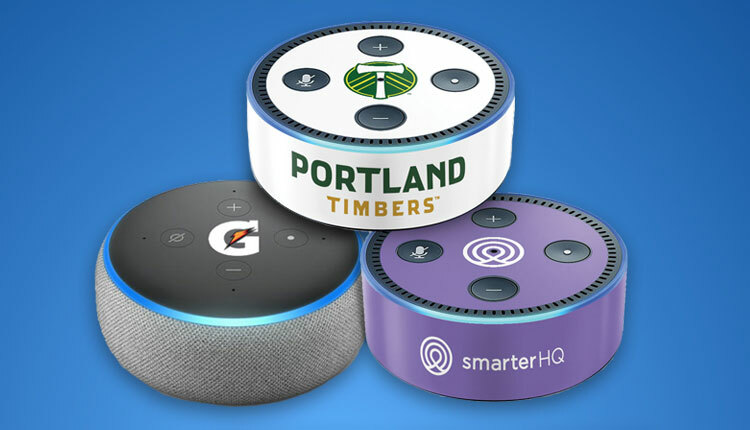 Personalized Amazon Echos are 2019’s hottest corporate gifts. When you think of the name “Alexa,” you probably conjure images of Amazon’s line of Echo voice-controlled smart speakers. Alexa is the disembodied voice that acts as a virtual assistant and can answer a wide range of questions. One of the more recent incarnations of the Amazon Echo line is the Echo Dot. It is the smaller, hockey puck-sized version of the original Echo cylinder that was first introduced in 2014. Its smaller size and more limited speaker and microphone range made it an ideal option for bedrooms or bathrooms. It also makes it a great promotional gift or incentive. Custom Amazon Echo Dots are a present that your customers won’t soon forget. They are fun, helpful, and full of unique surprises that will keep your clients entertained for years to come. The best part is that they will be looking at or thinking about your unique branding and logo almost every time they use it. A study by the Advertising Specialty Institute noted that 85% of people who receive promotional products remember the name of the advertiser on those products. But, promotional Echo Dots are a much more memorable gift. At iPromo, you can put your branding on two different types of custom Echo Dots: the second generation and the new third generation. There are a few main differences between the two different generations that are both cosmetic and functional. We’ll give you an overview of both options below. Before we discuss the Echo Dots’ differences, let’s take a look at how the device works and what it is capable of doing in general. For starters, Echo Dots require an internet connection to function properly, although you can use some basic features without one. The device is controlled by voice. It usually requires what is known as a “wake word” to draw its attention. Every Echo device’s default wake word is “Alexa,” meaning that any time you say “Alexa” the device will activate and start listening for commands. Other wake words (like “Computer” or “Amazon”) can be used instead. The most common function the Echo Dot is used for is its calendar and scheduling features. You can literally input calendar items with your voice and later ask the device about them at any time (or even schedule reminders). You can also teach the device to perform other tasks, even if the task in question isn’t technically compatible with the Alexa software. This is known as an IFTTT (“If this, then that”) rule. For instance, if the lights in your house can change colors but the Echo Dot is not compatible with that function, you can simply teach it to become compatible. On top of that, if you’re uncertain what else the Echo Dot can do, you can also use the “Skill Finder” feature to find yet another skill. For the most part, all Echo incarnations often the same basic functionality because they all employ the most updated version of the Alexa software. Again, Echo Dots are primarily used in smaller rooms and can even be connected to other Echo devices throughout the house and used as an “intercom” system. Clearly, promotional Amazon Echo Dots provide a lot of value to the consumer, which is why they are being increasingly used as a marketing tool. But, what are the differences between the second and third generations? The original Echo Dot was released in March 2016, followed by the second generation in October of that year. Both were similar in appearance to a hockey puck with firmer plastic edges around the cylindrical shape. The second generation improved voice recognition, speaker clarity, and the number of available colors (black and white). Of course, it also has a few new interior features that you won’t find in the prior generation. The developers at Amazon placed a great deal of importance on sound quality with the new Echo Dot. It has a 1.6-inch speaker that delivers 360 degrees of sound. The second generation, by contrast, features a 1.1-inch speaker that delivers sound out of a few openings in the external casing. Amazon claims that the third generation Echo Dot is 70% louder than previous iterations. It also made some improvements to voice recognition. It uses 4 far-field microphones which allow it to hear the wake word and any subsequent commands from a greater distance, even while other sounds may be present. The second generation Echo Dot uses a 7-microphone setup that was standard on earlier versions of the original Amazon Echo. It is not as effective at picking up quieter voice commands or voice commands from long distances. Both generations feature a 3.5mm port and Bluetooth capability that allow you to connect an external speaker to the Dot if you so choose. As we mentioned above, the two incarnations also contain the same exact Alexa software, so your clients won’t be missing out on any slick new features in that regard. There is no real concrete answer to this question. It really depends on your preference and whether you think your intended audience will prefer custom third generation Echo Dots or custom second generation Echo Dots. Obviously, there are objective improvements when it comes to the third generation’s better-quality speaker and microphones. Some may also prefer the new look of the third generation, especially with its fabric exterior and nifty color schemes. But, when it comes down to it, both devices offer the same functional experience with the Alexa software. You can also simply attach an external speaker to the second generation to improve sound quality. Additionally, only the second generation comes with the option for completely adjustable skins, allowing you to add full-color branding to the device. And, if price is a major concern for you, then the second generation may be the way to go. If you’re aiming for a younger and more technologically-involved demographic, then you may want to opt for the third generation. As you can imagine, having the newest item in a line of devices will appeal to the younger generation. They will also be glad they didn’t have to pay for it and will undoubtedly improve their opinion of your company because of your generosity. But, even that demographic can find a great deal of value in custom second generation Amazon Echo Dots. The device can easily be re-gifted or sold, ensuring that the initial recipient will be happy and that your branding will continue to be seen by whoever gets it next. In fact, it’s entirely possible that the logo on your promotional Amazon Echo Dots will be seen by multiple owners in their lifespans. So you really can’t go wrong when choosing which Echo Dot to select. So, Why Choose Custom Amazon Echo Dots? There are a lot of reasons to choose branded Amazon Echo Dots for your next marketing campaign, not the least of which is the device’s usefulness to whoever receives it. Because of the highly-valued and useful nature of the Echo Dot, you’re bound to increase brand favorability and loyalty. In fact, one study by the British Promotional Merchandise Association showed that over half of people who receive promotional products improve their opinion of the advertiser. More importantly, almost 80% of respondents said they would continue or start doing business with the advertiser. That’s good on its own, but it also does not take into account the value of the promotional product in question. 80% of consumers are more willing to business with a company that gives them a promotional product, even if the item in question is just a t-shirt or a pen. Imagine how much more they will want to do business with you when you give them a custom Echo Dot. This is a high-quality gift that not everyone has. Beyond that, word of mouth spreads. Anyone who receives a branded Echo Dot will likely tell their friends where they got it. It will also be a conversation starter when they have guests over. Your company will be talked about favorably to a multitude of people because of even one Echo Dot. You may think all of this is too far out of your budget, but that’s not necessarily the case. The minimum order amount for both generations of Amazon Echo Dots is only 12, meaning that this campaign could reasonably cost you less than $1,000. If you’re interested in ordering promotional Amazon Echo Dots, let us know today.